Owl photographed by Raymond W. Stilborn. The Grammar Owl was undecided regarding which grammatical quandary to post about today. He scratched his head, totally perplexed. Have you ever seen an owl do that? Those talons are so sharp! Just the thought makes me flinch with imagined pain. Back to our perplexed owl. After scratching his head, he stretched out his leg and pondered his talons for a moment. Anyway, likely you can see where the Owl is going with this. We’re going to talk about commas today. 1. Commas separate dates. Not the cooing, lovebird type of dates. We don’t want to separate them (well, not all the time, anyway). Nor is Owl referring to the dates which enhance many recipes. 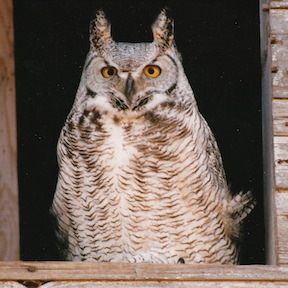 Oh dear — I see Owl tapping one talon on the edge of his barn window. I’d better get to the point of this point. Commas separate calendar dates when they are written. For example, Monday, November 17, 2014 requires a comma after Monday, and a comma after the number of the date, before the year. 2. Commas separate dialogue from dialogue tags. “I would like a date square with my tea,” said Lizzie. Note the two exceptions: if there is a question mark or an exclamation mark following the dialogue, no further punctuation is necessary. “Would you like a date square?” asked Beth. “I want a date square, too!” said Eliza. 3. Commas separate adjectives when two or more are used together. “Instead of tea, I’d like a tall, cool, ice-filled glass of lemonade,” said Anne. 5. Commas set off clauses that add information, but are not crucial to the meaning of the sentence. Beth, who hadn’t been paying attention, finally realized that Anne wanted lemonade. If the clause that’s enclosed in commas is removed, the basic meaning of the sentence remains. Beth finally realized that Anne wanted lemonade. If you learned in school that FANBOYS is a good acronym for remembering coordinating conjunctions, you’re on your way to using commas correctly in this instance. For those of us who didn’t learn that mnemonic device, myself included, it’s a handy tool to memorize. For And Nor But Or Yet So (which, in this case, is not merely a needle pulling thread) — these are the seven coordinating conjunctions. Eliza will have tea, but Anne prefers lemonade. “Eliza will have tea” and “Anne prefers lemonade” are complete clauses of equal value. Each could be a sentence on its own, but when left together in one sentence, and separated by a coordinating conjunction, there must be a comma after the first clause. 7. Commas are used to prevent confusion in reading. Tea cakes and lemonade were served at Beth’s party. Hmm… Do you recall tea cakes being on the menu? With proper comma placement, we read Tea, cakes, and lemonade were served at Beth’s party. (We also see that Beth is partial to the Oxford, or serial, comma, which we won’t get into here.) The use and misuse of this grammatical rule is lampooned to great effect on the internet, as well as in the grammatical guide Eats, Shoots, and Leaves by Lynne Truss. 8. Commas are used to set off words such as therefore and however when they interrupt the flow of the sentence. “I don’t like tea. I would, therefore, prefer lemonade, instead,” said Anne, for the third time. Do you think Anne has made her point? Beth, however, poured tea into Anne’s glass. Oops. If you have any questions relating to grammar or word usage, please contact the Grammar Owl and me at mail (at) flubs2fixes (dot) com. I’m always happy to receive copy editing requests as well, at the same email address. Information about the services I offer through Flubs2Fixes Copy Editing and Proofreading can be found here, while the rates and procedures can be found here. And for more comma fun, check out my new Grammar — Commas board on Pinterest! GAH, Beth! This is so funny and so informative. Everything I write has 800,000 commas. I’m a huge comma fan. I put them in all of the 8 places you mentioned, and then I add a ton more. That’s when it turns ugly. This was such a fun post! Haha, Genevieve — I hear you on that 800,000… The Grammar Owl suggests you try to whittle it down to 799,500 per manuscript, painful though that may be. 😉 I’m glad you enjoyed the post. I had such fun writing it! Thanks, Genevieve! This is a good beginning for comma usage, but there is a lot more to be covered. You might want to do a second post on commas. I used to tease my students and claimed they had little comma sprinklers they would shake over their papers when they finished their writing because there were so many commas that seemed to have no purpose. I have writers in my critique group who seem to have the same problem. I’ll be passing your post along. Thanks. Thanks, Rosi. Great idea for a second post. I will slot it in for January. (December is already planned.) I like your image of comma sprinklers! Since commas and periods are the two most frequently used punctuation, I can understand why so many errors are made. Throughout my career, as an educator, I have taught English grammar and punctuation. However, I need reminders. Reminders are good. The following rule always seems to be a challenge for me . . . Use a comma before any coordinating conjunction (and, but, for, or, nor, so, yet) that links two independent clauses. P. S. Hope my comma usage is correct! Suzy — commas are sneaky things that like to trip the unwary. You are not alone in being challenged by the coordinating conjunction/independent clauses rule. Many people have trouble with that one. Ha! Anne, Beth, Eliza, Lizzie? (#3) “Those’re some interesting names, Ms. Elizabeth Anne Stilborn,” I say to myself! (#2) So, even though you want lemonade, you pour yourself tea? 😉 (#5) 😉 Great post! Commas are where I trip up most, Beth. Thank you for these examples. I too am a big fan of the Oxford comma! Please do a follow-up post. Comma trip a lot of people up, Joanna! Watch for a follow-up in January. Thanks! Plurals apparently trip people up, as well. In my previous comment, I should have typed “commas” rather than “comma.” My fingers must be asleep!